"We're all together here; we all look after each other," said Tasos Sakkas, a chef who immigrated from Greece in 1971. Now manager of the Symposium restaurant near Columbia University, he bought his two-family house near the 65-acre riverfront Astoria Park in 1994 after renting in the neighborhood for more two decades. "I love Astoria. I love New York. I love the U.S. That's why I stay." Astoria was a separate village until 1870, when it became part of Long Island City, which in turn was incorporated into New York City 28 years later. It is "one of those neighborhoods almost too good to be true," said Bob Singleton, president of the Greater Astoria Historical Society. "Everyone in the neighborhood gets along. It's not a place where social status is terribly important." The slogan "only 15 minutes from Bloomingdale's" describes location, not shopping habits. As the essence of a working-class neighborhood in the 1970's, at the height of Greek immigration, Astoria was home to TV's Archie Bunker. Despite an influx of young professionals, musicians and actors seeking refuge from Manhattan prices, and a nudge toward the chichi with two Starbucks with wireless connections, shops like Victoria's Secret and a vibrant night life, Astoria still has blue-collar roots. "It's the bedroom community of all hotel and restaurant workers," said Demetrius Partridge of Partridge Realty, established by his late father in 1957. Harry Partridge, a Cypriot immigrant who Americanized his name when he arrived in the 1920's, worked as a Hotel Pierre cook before buying a rooming house, which he leveraged into several hundred apartments. EASY access to Manhattan is but one draw. In the same breath, most people mention food. Costco, the warehouse club, has opened in Astoria, but many local residents still prefer to buy their lamb chops at neighborhood butchers and handpick their produce out of vegetable stalls. And if kitchens are too small or work schedules too hectic, there is always some place to eat out or take out. "My wife and I never eat in, maybe once every three or four months," said Daniel O'Shea, a doorman at Lincoln Towers on the Upper West Side. "We eat very well." Another plus residents often cite is security. "I feel safe here," said Karen Imas, publication manager of the Council of State Governments eastern region, who moved to the neighborhood a year ago after growing up in Forest Hills. Statistics from the 114th Precinct confirm that crime reports so far this year are down 7.65 percent from last year and 65 percent from 10 years ago. 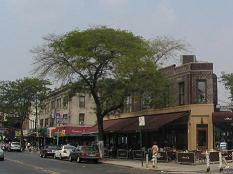 Before the Sept. 11 attack, Astoria was touted as "New York's undiscovered neighborhood" and the rush was on. "About three years ago, it was crazy," remembered Grace O'Sullivan of Grace Realty. "If I had an apartment to rent in Astoria, it went in five minutes with a first, last and security deposit. Now it's security and first month's rent, and it takes longer to rent." She sees a good supply of one-bedrooms on the market with $1,000 to $1,100 bringing high ceilings, wood floors and other amenities. A plus for renters in older buildings is that heat and hot water are usually included in the rent. Carlton Vann, a program coordinator with the Social Science Research Council in Midtown, considered New Jersey, Brooklyn and Manhattan before settling on a large one-bedroom apartment for $1,000 a month on Astoria's border with Long Island City. "Large is the key," he said. "The bedroom is probably as big as a studio in Manhattan." He immediately felt right at home with "the fishmongers and cake shops," after spending nearly eight years in Japan. The housing stock has expanded in the last few years with new construction, mostly small-scale projects by local entrepreneurs and builders. Joseph Pistilli of the Pistilli Realty Group in Astoria is betting that a new wave of immigrants � from SoHo, NoHo, the Upper West Side and Brooklyn � will buy into two conversions his company is readying for 2004-5. The old Eagle Electric Company near Astoria Park will be refurbished and enlarged to create 188 co-op apartments, studios to three-bedrooms and including lofts. The former Stern's warehouse on Ditmars Avenue, once part of the piano factory, will be transformed into 200 condominiums with retail space and a 260-car parking garage. Prices will be "market value," Mr. Pistilli said. "Ten to 15 years ago, we didn't know where Astoria was going," said Mr. Vallone Jr., whose family arrived from Sicily by way of Manhattan more than 70 years ago. Today, he sees a new vitality in the conversion projects, new clubs opening weekly and new businesses and banks on Astoria's shopping streets. "Now you can't get a spot on the commercial strips," he said. The village rivaled Hollywood in cinema's early days. Astoria Studios, established in 1920, accounted for a quarter of all films produced in the country in 1921 to 1927, with stars like Rudolph Valentino and the Marx Brothers on the lot. Later on, "Sesame Street," Woody Allen's "Radio Days" and hits starring Harrison Ford, Meryl Streep and Al Pacino have been filmed at what is now Kaufman-Astoria Studios, which also has a multiplex movie theater.